Francis Holland has a blog post called, Why Does it Upset Whites So Much That Blacks Spell "Black" with a Capital "B"? I candidly wonder what Francis, a former member of the afrospear has to say about the recent article in the Huffington Post regarding an investigation into Brazil's Sao Paolo Fashion Week? You see as reported by the Huffington Post the investigation is to determine if participants were including enough black and mixed-race models has ended with a settlement between fashion brand companies and prosecutors, as reported by the BBC. The Huffington Post notes, The settlement requires that participant companies meet a minimum 10 percent threshold of models who are either of African or Indigenous descent, and comes in the aftermath of an investigation last year that found the non-white contingent of models to be only 2.3 percent, according to the BBC. The first African-American female rabbi in the world. Across America people are shocked at the brutal assault of a black man after a high speed chase in Alabama. As reported in The Washington Post, in this undated photo released by the Jefferson County Sheriff's Office, Anthony Warren in seen. A video released by the sheriff's office shows five Birmingham police officers beating an apparently unconscious Warren after a roadway chase in Alabama on Jan. 23, 2008. BIRMINGHAM, Ala. -- Five Birmingham police officers were fired Wednesday for beating an unconscious suspect ejected from a car after a chase, an attack captured on a patrol car videotape that didn't surface publicly for a year. Police Chief A.C. Roper said the officers, who were not identified, were seasoned veterans but acted in a "shameful" manner. The video shows police pursuing Anthony Warren's van on Jan. 23, 2008. One officer on foot was hurt when the van swerved through traffic. It overturned on a ramp, ejecting Warren, who lay motionless as officers ran toward him. The video shows them beating him with their fists, feet and a billy club. An attorney representing Warren in a civil case said he was hospitalized after the chase and didn't realize he'd been beaten until a prosecutor preparing for his trial requested the tape, saw the attack and told the defense about it. Roper said the department had "terminated 50 years of combined service due to 10 seconds of injustice." AAPP says: The brother was wrong for endangering the lives of people in that high speed chase, yet the police acted like out of control animals. Yes, the department had "terminated 50 years of combined service, one has to wonder if this is the only 10 seconds of injustice by these guys." Congratulations Mayor of Birmingham for your quick decision. Now fire more people who covered this up. I guess they would love to have a lynching party. The Alabama Bureau of Investigation is investigating the beating, who altered the tape, in what agency that alteration occurred, and whether it was intentional. The FBI said Wednesday night it had launched a civil rights investigation of the incident. The tape of the beating of Anthony Shannon Warren, which the Birmingham Police Department released publicly Wednesday, is drawing national attention and has spawned additional internal and criminal investigations. The five officers' attorney, Gayle Gear, said the men believed Warren posed a threat and responded in accordance with their training. The incident happened Jan. 23, 2008, when a police officer tried to question Warren, now 38, about possible drug activity. A 22-minute chase followed, during which Warren struck a Hoover police officer and then was thrown from his own van after he crashed. Authorities said he was unconscious when the five officers began kicking him and beating him with a billy club and fists. The battering was captured on police video until a sixth officer turned off the lights and siren in the cruiser that held the camera, automatically shutting off the camera. There is more - You have to read the whole story at The Birmingham News. 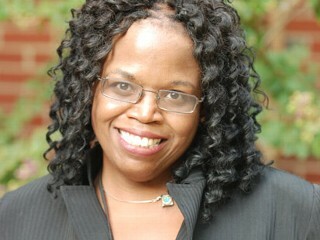 Don't forget to email Carol Robinson at: crobinson@bhamnews.com regarding her great coverage and indepth investigation. The allegation of tampering is also an issue raised in a claim filed with the city of Birmingham on behalf of Warren, shortly after he entered his guilty plea. The claim detailed Warren's injuries, which included a concussion and a skull fracture, but also alleges the Police Department interfered with the administration of justice and conspired to tamper with evidence. "Also of great concern to us is the fact that .¤.¤. everything after the van flipped, the entire beating, was deleted on the tape given to the defense counsel, with clear intent to suppress," said lawyer Wendy Crew, who represents Warren. "The tampering with the evidence and the editing of the video and proffering it was clearly a conscious and deliberate act." Crew said Warren was shot with a Taser before the high-speed chase, and contended that the chase should have never started. Warren, who was hospitalized for five days after the incident, was unaware he had been beaten until the video came to light. "This case isn't about Anthony Warren," Crew said. "It's about a systemic problem with training, with failing to intervene, with the culture of tolerance of this kind of behavior and about the deliberate tampering with evidence." Roper said all aspects of the incident remain under investigation. "One thing is for certain, the video, as incriminating as it is, was kept safe and secure by this department for over a year," he said. "When it came to our attention, we launched an internal investigation which is still continuing." Gear, the officers' lawyer, said they all responded according to procedure. None saw Warren ejected from the van, she said, and they approached him presuming he was dangerous and were unaware he was unconscious. She said Dewitt saw Warren on the ground and approached, shouting: "Show me your hands!" as he was trained to do. When Warren did not comply, Dewitt struck him with a baton to make him show his hands. As Doran approached, Dewitt slipped. Thinking Dewitt had been shot, Gear said, Doran hit Warren. "In those 11 seconds we had two officers frantic to get this man to show his hands," Gear said. Cleveland, the third man to arrive, hit Warren in the pressure points on the neck, non-lethal strikes within Birmingham policy, Gear said. "He tries the procedures," she said. "When it doesn't work, he backs off." Boackle struck Warren on a part of the leg intended to disable him before seeing he was unresponsive. Prevo was the last officer to hit Warren. If supervisors thought the officers had used excessive force, they would have reprimanded them on the scene or included it in reports of the incident that went through several people before ending up on the police chief's desk, Gear said. The officers, whose time on the force ranges from seven to 13 years each, have appealed their dismissals to the Jefferson County Personnel Board. Two of the five officers who were fired changed positions after the January incident. Boackle was promoted to sergeant in August 2008, Gear said. Prevo moved from the narcotics unit to the burglary unit in October 2008. This was the first time any of the officers have been called before the police chief for a disciplinary matter, Gear said. One of the officers, Doran, received a legislative medal of honor for carrying a woman to safety from a second-floor apartment during a fire, Gear said. Another, Dewitt, had been honored as a finalist for the FOP Officer of the Year Award. She said they are devastated by the entire disciplinary process. "These are the best examples of our fine police force that we have," Gear said. Didn't the Republicans lose the election? 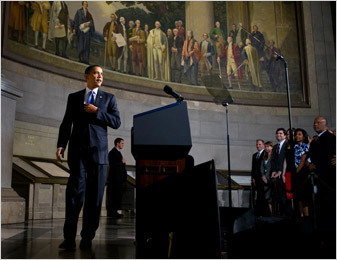 President Obama at the National Archives building on Thursday. AAPP: I'm concerned about the President's plan. Why are we Imprisoning detainees who can't be tried and can't be turned loose? Sounds illegal to me. Get this, Obama conceded that some would end up in U.S. prisons and insisted those facilities were tough enough to house even the most dangerous inmates. The president also said, "We will be ill-served by the fearmongering that emerges whenever we discuss this issue." and his plans to close the Guantanamo prison camp on Thursday. He also promised to work with Congress to develop a system for imprisoning detainees who can't be tried and can't be turned loose. 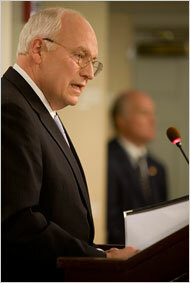 Mr. Cheney at the American Enterprise Institute. The CIA's "enhanced interrogation techniques" are methods of torture. They can cause severe and often irreversible harm. Under American law, they are war crimes. The use of torture against detainees in US custody has degraded the discipline, traditions, and honor of our armed services and our country. For these reasons, the CIA's "enhanced interrogation techniques" should be immediately and explicitly prohibited by the United States - PERIOD! I just finished reading an article regarding Cathy Hughes and her call to action to help Save Black Radio! In the article she writes about how the Honorable John Conyers, our 80 year old African-American Congressman is the sponsor of a new bill that could put many black owned radio stations out of business. And force others to abandon their commitment to provide free music, entertainment, news, information, and money losing formats like gospel and black talk. Hmm ... well there appears to be a need for further review. Check this out: Black Agenda Report.com Managing Editor Bruce Dixon has written about this issue in more detail in his post; Will Saving Black Radio Save Local News And Public Service? Bruce says: A few weeks ago Radio One founder Cathy Hughes, echoed by Tom Joyner and dozens of other radio personalities, sounded the alarm. HR 848 they cried, a bill to make stations pay a “performance rights” fee for every song played, was a mortal threat to black radio. 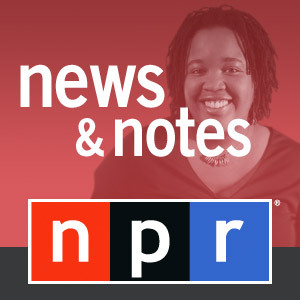 In a widely circulated blog post which was echo-blasted to everybody on any Radio One email list, Hughes cited black radio's stellar contributions of news, diversity and local content as reasons why African American communities should rally to protect it. She even claimed black talk and gospel were “money losing formats ” as if these were public services and tithes offered out of Radio One's bottomless reservoir of corporate good will. The laughter was pretty hard to suppress. Commentators like Paul Scott and Mark Anthony Neal ran columns titled “Should We Save Black Radio? ” and “Should Black Radio Die ?” to which they answered “probably not” and “maybe.” The widely known fact, as BAR's Glen Ford pointed out six years ago in “Who Killed Black Radio News ” is that Radio One led the industry in purging news, public service and local content of all kinds from its airwaves in favor of cheap, syndicated, uninformed talk, mostly about celebrities and relationships. Radio One's payola-influenced playlists are indistinguishable from its white-owned black radio competitors. Perhaps to protect their audiences from too many confusing facts, Tom Joyner, Cathy Hughes and the rest of the "save black radio" posse never mention that white broadcasters, the National Association of Broadcasters in fact, are just as opposed to HR 848 as they are, for most of the same reasons. So the truth is surely more complicated than Cathy Hughes and her posse would have us believe. HR 848, the so-called Performance Rights Act, which Hughes says may be the death knell of black radio is sponsored by Detroit congressman John Conyers. It has dozens of high-profile celebrity boosters. The legislation will supposedly compensate performing artists – authors, composers and copyright holders are already taken care of by other intellectual property laws – when their work is played on the radio. Putting aside for the moment the economics of radio stations, it doesn't sound like an inherently bad idea. Artistry is work, and work ought to be paid, right? Will Revenue From the Performance Rights Act Actually Reach Performers? The answers here are: not much and not likely. Given the historic business practices of the industry, and the provisions of HR 848, it's safe to say artists won't see much of this money. It will be extracted from radio stations,and collected and disbursed by Sound Exchange or other representatives of the same suits who have made an industry out of stealing from artists since the dawn of time, or at least since recording business managed to make the recorded product it distributed and controlled, instead of the artists' live performances which it did not control, the music industry's main revenue stream. HR 848 also guarantees industry execs the right to rake an unspecified portion off the top for handling charges. Section 6(1)(1)(a) of the law says that entitlement of the artist to these payments is “...in accordance with the terms of the artist’s contract,” rather than in addition to or outside of and not subject to the contract. In plain English that means a cleverly written or dishonestly administered contract can easily divert these new “performance royalties” to pockets other than those of the performers. I'm glad that the new internet based Black Talk Radio Network™ is up and going. It will eliminate much of the politics involved in radio, and provide more control to average black Americans. Republican National Committee Chairman Michael Steele, working the room at a luncheon gathering of party officials yesterday, had the same parting words for each man he met: "Stay out of trouble." Or, if speaking to a couple, he would tell the woman: "Keep him out of trouble." Coming from Steele, this advice had an ironic ring. The RNC chairman has managed to get into trouble with comic regularity during his first few months on the job. His latest brush with trouble had come only minutes before the lunch, when Fox News broadcast an interview with Steele in which he complained that party leaders -- the very people he was about to have lunch with -- have "their knives bared" for him. "I was thinking of changing my cologne," he confessed to Fox's Carl Cameron. But it's what's coming out of Steele's mouth, not his pores, that's causing him trouble. He called Rush Limbaugh "incendiary" and "ugly." He described abortion as an individual choice. He spent $18,500 decorating his office, which he had called "way too male for me." He offered some "slum love" to Indian American Bobby Jindal, the Republican governor of Louisiana, and speculated that the GOP base rejected Mitt Romney "because it had issues with Mormonism." Steele had promised to reach "urban-suburban hip-hop settings" as part of his an "off the hook" party-building effort, but party officials moved to give the chairman the hook: They called this week's special meeting of the party and were considering a no-confidence vote when Steele, trying to prevent a mutiny, agreed to have some of his spending powers stripped. I agree with Sophia Nelson, I like him. I want him to succeed, yet like Sophia, I am struggling with why this very intelligent man continues to go out and make TV appearances and speeches that continue to diminish him as a thoughtful person, instead of offering us a vision of hope. Good points Sophia! But, then again, are black Republicans jumping ship before they are thrown overboard? Is the king family stuck on stupid for opposing the MLK film deal struck by one of the brothers? will get a starring role? I mean has anything really changed in hollywood? Dreamworks Studios said in a statement it had secured the rights to make the film from the King estate, which it hoped would create the "the definitive portrait" of the murdered activist's tumultuous life. "We are all honored that the King Estate is giving us the opportunity to tell the story of these defining, historic events," Spielberg said. AAPP: oops, rewind! USATODAY.com reports, DreamWorks plans the first big-screen portrayal of the Rev. Martin Luther King Jr.'s life, the studio announced Tuesday, but two of King's children immediately threatened legal action because the film deal was brokered without their blessing. Without their blessings??? OMG the King family is still hustling the image of their dad. Getting paid by everyone and their mama, yet the place in which their dad his buried is in disrepair. You got to be kidding me. These King children are off the chain! Get this, as reported by USATODAY.com Dexter King, one of the late civil rights leader's sons, said in a press release that he hoped the movie would "be the definitive film" on his father's legacy. Two other King siblings —Bernice King and Martin Luther King III— said they had no input in the deal. Dexter is the chairman and chief executive officer of King, Inc.
AAPP: King, Inc. You got to be kidding me.... King, Inc. These children of Martin and Coretta are acting like little children. Their legal disputes regarding their parents' intellectual property in the past year have been an insult to the lives of their parents. But then again, they all seem to be more interested in tarnishing their parents' legacy with his "business decisions" that peddle Martin Luther King, Jr., for thier own economic interest. Martin Luther King III says, "It's not that we are against a film," he said. 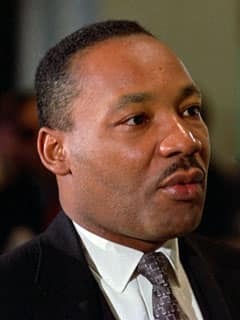 "It's very interesting to me that a company would engage in a business arrangement knowing that there's severe controversy around many issues pertaining to the estate of Martin Luther King Jr."
I agree, DreamWorks should have layed low, or at least partnered with black film makers and black writers in this planned production. I'm still concerned about the representation of black people in films. At this point, Dexter King seems to be nothing more than a two bit hustler. This guy even used his name to get an $800,000 licensing deal with the foundation tasked with building a memorial to their father on, of all places the National Mall in Washington, D.C. I Hope Dexter don't play his dad, he may look like him, but he sure is no Rev. Dr. Martin Luther King, Jr. Candidly, Dexter seems to be nothing more than a white actor in black face. That's my thoughts, but, then again you have something to say, what do you think? A big hat tip and shout out to Sojourner's Place, Villager at Electronic Village and so many afrospear bloggers who have joined with Amnesty International in it's Global Day of Action for Troy Davis. Get this, even the NAACP is getting involved. They write: Despite a strong claim of innocence, Troy Davis, an African-American man from Georgia, faces execution for purportedly killing a police officer. Seven out of nine witnesses have recanted or contradicted their testimony, no murder weapon was found, and no physical evidence links Davis to the crime. The Georgia Board of Pardon and Paroles has voted to deny clemency, yet Governor Sonny Perdue can still exercise leadership to ensure that Troy Davis's death sentence is commuted. Please sign the petition asking him to support clemency for Davis. The Georgia State Conference of the NAACP, which has been a leader in the fight for Troy Davis, will deliver the petition to the governor to ensure your voice is heard. The case of Troy Davis highlights the need for criminal justice reform in the United States. The NAACP, with its long and accomplished history of promoting civil rights, is on the forefront of a movement to revolutionize the criminal justice system. More than 60% of the people in prison are people of color. For Black males in their twenties, 1 in every 8 is in prison or jail on any given day. These trends have been intensified by the disproportionate impact of the "war on drugs," in which three-fourths of all persons in prison for drug offenses are people of color. The most extreme end of the criminal justice system, the implementation of the death penalty, is no exception: currently, more than 41% of those on death row are Black. We must fight for change. 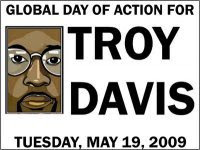 Please help us fight for the rights -- and life -- of Troy Davis today. Davis was sentenced to death for the murder of Police Officer Mark Allen MacPhail at a Burger King in Savannah, Georgia, a murder he maintains he did not commit. There was no physical evidence against him and the weapon used in the crime was never found. The case against him consisted entirely of witness testimony which contained inconsistencies even at the time of the trial. Since then, all but two of the state's non-police witnesses from the trial have recanted or contradicted their testimony. Many of these witnesses have stated in sworn affidavits that they were pressured or coerced by police into testifying or signing statements against Troy Davis. I agree with the NAACP: Please urge Georgia Gov. Perdue to commute Davis's sentence and bring justice to this case by signing our petition today. Visit GFADP to see what activists are doing in Georgia. Clergy and Religious Leaders can add their name to sign-on letter created by Amnesty International. Write a letter to the editor of your local paper. It's quick and easy using the ACLU's website. Text "TROY" to 90999 to help spread the word with your cell phone. Please do not contact the Georgia Board of Pardons and Paroles directly right now, as doing so could be detrimental to Troy's case. Instead, you are encouraged to contact Georgia Governor Sonny Perdue. If you have a blog, blog about this situation today. I finally purchased an IPhone and was disappointed that I could not use Microsoft products. Well, that was until I read on how Citrix has Microsoft Windows apps on the iPhone too. Citrix launched the Citrix Receiver iPhone app, available now free for download from the iPhone App Store. I had a chance to spend some time today with the Citrix Receiver iPhone app connected to the Citrix Cloud Center. Citrix Receiver was surprisingly speedy to launch and very responsive when running apps like Solidworks, and Microsoft Word, Excel, and PowerPoint. In addition to running desktop windowed apps, Receiver also supports Silverlight, Flash, and Flex based applications. Along with its good responsiveness, the touch interface of the iPhone worked well tapping and controling icons, menu items, popup menus, and buttons. Citrix has also added a well designed landscape keyboard (something most iPhone apps will have to wait for until iPhone OS 3.0 is out this summer) that even includes Alt+Tab, Delete, Esc, and page up/down keys. I wonder if Ctrl-Alt-Del will reboot my iPhone, lol. I've included some screenshots and you can see full sized images here. You can check the Citrix Receiver by getting a demo account at www.citrixcloud.net and then download the client on your iPhone. Check it out. I'd love to hear what you think. For more information about enterprise networking, go to NetworkWorld. Story copyright 2008 Network World Inc. All rights reserved.